The East Finchley station (Northern Line) was rebuilt in art deco style in the 1930's. Designed by Charles Holden, influenced by Dutch architects of the time. 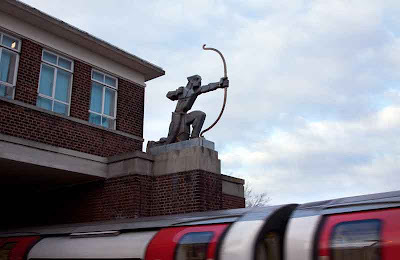 The Archer is firing his arrow toward London and its said that his arrow would reach the next station on the line before the tube. And now I like the humour of it too. Looks like Robin Hood racing the train. I love the quirkiness of so many of the buildings you show. Where we live in the States, everything is boring. Thank you for answering my question even before I asked it. This is a nice shot. As far as the arrow vs. train claim, I think in this day and age the PR wonks would probably advise against making that claim. Nowadays folks would have a heyday with it. 'the arrow wouldn't have to be very fast.....' etc. etc. I think folks were a lot less cynical back then. Hi, Mo! When you turn around in a big city, you look up and you detects many fine sculptures and fine architecture! So look up! I thought it was Robin Hood atop the railway station. I love art deco, and the station looks a good example. I am not exactly an art deco fan but i liked the shot.